BURBANK, CA (May 16, 2018) –The CW’s longest-running DC series will be coming to a city near you on August 14, 2018 as Warner Bros. Home Entertainment releases Arrow: The Complete Sixth Season on Blu-ray and DVD. Averaging 2.3 million Viewers weekly for each original episode, Arrowis the #3 series on The CW season-to-date amongst Adults 18-34, behind only The Flash and Black Lightning. * The release contains all 23 exhilarating episodes from the sixth season, plus the show’s 2017 Comic-Con Panel, the crossover featurette and much more. 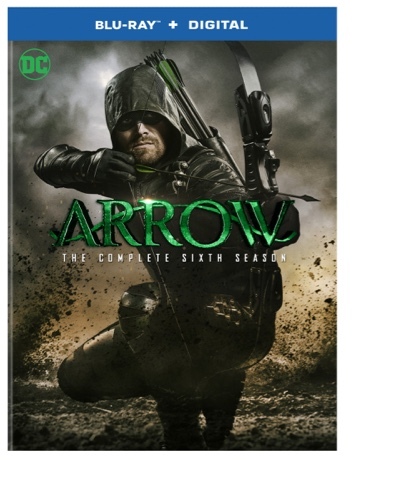 Arrow: The Complete Sixth Season is priced to own at $44.98 SRP for the DVD and $49.99 SRP for the Blu-ray which includes a Digital Copy. Arrow: The Complete Sixth Season is also available to own on Digital via purchase from digital retailers. Arrow stars Stephen Amell (Teenage Mutant Ninja Turtles: Out of the Shadows), David Ramsey (Dexter),Willa Holland (The O.C. ), Emily Bett Rickards (Brooklyn), Echo Kellum (Sean Saves The World), Rick Gonzalez (Reaper) and Juliana Harkavy (Dolphin Tale), with Katie Cassidy (A Nightmare on Elm Street) and Paul Blackthorne (The River, The Dresden Files) . Based on the characters from DC, Arrow is produced by Bonanza Productions Inc. in association with Berlanti Productions and Warner Bros. Television, with executive producers Greg Berlanti (The Flash, Supergirl, Riverdale, DC’s Legends of Tomorrow), Marc Guggenheim (DC’s Legends of Tomorrow), Wendy Mericle (Desperate Housewives) and Sarah Schechter (The Flash, Supergirl, Blindspot, Black Lightning). 8. "Crisis on Earth-X, Part 2"
13. "The Devil's Greatest Trick"